The new look Yahoo will be unveiled Tuesday. Yahoo Inc. is sprucing up its Web site's home page with a long-promised makeover that is supposed to make it easier to see what's happening at the Internet's other hot spots. The revamped home page, scheduled to debut Tuesday in the United States, is part of an overhaul aimed at recapturing some of the buzz that Yahoo has lost to increasingly popular online hangouts like Facebook, MySpace and Twitter. Even as Yahoo's star has faded, its Web site has remained among the Internet's busiest. More than 570 million people worldwide came to Yahoo in May, according to the most recent data available from online research firm comScore Inc. The retooled page will be introduced in the United Kingdom, India and France later this week. It will roll out to the rest of the world during the next year, with the option to retain the old design starting to phase out this fall. The Sunnyvale, Calif.-based company is hailing the new look as the biggest change to its front page since Yahoo's Web site launched 15 years ago. It's the first time that Yahoo has overhauled its home page since 2006. "Every pixel on the page is relevant now," boasted Tapan Bhat, a Yahoo senior vice president who oversaw the revisions. "We have taken out a lot of our own stuff that was creating a dead zone for our users." After spending the past 10 months tinkering with the redesign, Yahoo has a lot riding on the new look. The company sorely needs a lift, with its profits mired in a slump that has led to three different chief executives since June 2007. Carol Bartz, the latest CEO hired six months ago, has predicted the revised home page will help revive the company by re-establishing its Web site as an Internet gateway for more people. If she is right, Yahoo could get a better handle on its users' interests and ultimately sell more of the ads that generate most of its revenue. Yahoo hadn't intended to take the wraps off the redesigned page until the fall, but apparently felt like it had all the pieces in place now. While Yahoo was trying to figure out what it wanted to include in the new home page, other online social hubs have become even more deeply ingrained in people's lives. Facebook, for instance, now has more than 250 million regular users worldwide, up from about 100 million last September when Yahoo first began to publicly discuss its vision for the home page. Meanwhile, Twitter has evolved from a quirky obscurity into a pervasive communications tool for passing along blurbs of personal information, as well as links to news stories and photos. Yahoo is betting its home page will be more useful if it's easier for people to connect with information and services available elsewhere. Users can plant a variety of applications from other Web site onto a "My Favorites" section of the redesigned front page. 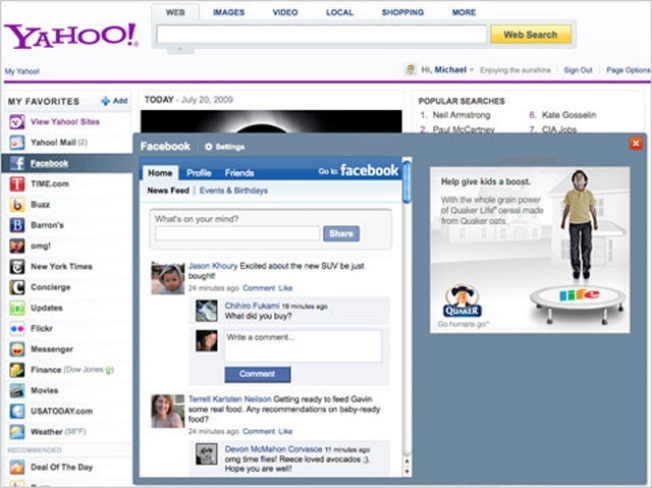 The 65 applications initially available on Yahoo's new page include competing e-mail services from Google Inc. and AOL as well as plug-ins for Facebook and MySpace. Once the outside applications are set up, Yahoo visitors can scroll over their favorite sites to get a glimpse at what's happening elsewhere without leaving Yahoo. The front page's news section will automatically feature stories from newspapers located in a user's area and enable people to broadcast what they are doing or thinking, just as millions already do every day on Facebook and Twitter. Yahoo isn't currently offering a Twitter application, but will eventually, Bhat said. The home page preferences programmed on a computer can also be transferred to appear on mobile phones and other handheld devices.